Lavender Essential Oil is produced from the spikes of the flower called lavender. The oil is known for its brilliant fragrance. 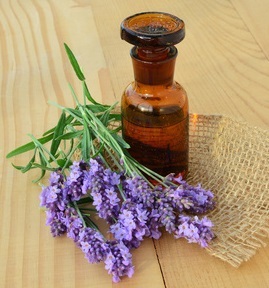 Pure Lavender Oil is used to produce various perfumery products. It also has several medicinal uses. We produce Lavender Oil of superior quality which is free from all kind of impurity. We are also engaged in the trade of Wholesale Lavender Oil. We are a leading exporter of Lavender Oil in India who supplies their products to different countries. A very valuable Lavender oil plant is usually found at altitude of 700 to 1400 meters and is highly valued. Pure lavender essential oil is endowed with many felicitous properties and has many uses in food industry such as sauces and etc. Cosmetic uses: Application in perfumery and production of soaps also used in medical field which is to be under a professional supervision. LAVENDER OIL IS ONE OF THE MOST NOSTALGIC FRAGRANCES, bringing scenes of childhood vividly to the mind: high summer days that last forever, lavender bushes shimmering against the blue sky, the bees blundering in and out among the flowers, stirring up the intense, sweet sensation. Lavender FieldBut lavender is much more than just pretty & calming. It is one of the most powerful remedies in the plant world, offering both physical and emotional relief for problems as varied as burns, migraines, insomnia, insect bites, skin problems, infections, stress and nervous tension. It owes this amazing spectrum of healing powers to its complex chemical makeup. AOS Product Lavender Oil in its purest form is known to be of great assistance to the recovery and protection of the respiratory system. The uses for lavender oil are many. I took a course in aromatherapy and totally fell in love with this oil. It smells great and the benefits of lavender oil is wonderful. It's been called a universal oil because it balances the body and is known to work wherever there is a need. If in doubt use lavender! It's like having a medicine chest in a bottle. Excellent for aching muscles, relaxation, stress relief. Add 6-8 drops Lavender essential oil after running the water and vigorously agitate water. Add the drops to a capful of milk or Epsom salts and then put in the bath as this helps to disperse the oils throughout the water. This is a great way to receive the benefits of Lavender oil. Lie back and enjoy!